OK here we go…..as the month of June arrives the landscape goes Ka-Bloom! June is a month we swoon over the natural beauty of bloomers in the landscape. My Mom told me there would be “daisies” like this. It’s a combination of sunshine along with perennials in their prime while the May planted annuals take root and begin to perform on nature’s stage. The landscape Roses radiate while the Peonies pop in their prime. Allium giganteum tower above the garden’s performance, while Sweet Woodruff and blooming Ajuga provide a carpet under stunning Iris. And no, Ajuga is not a spring break hot spot in the Caribbean. June can make you swoon to the intoxicating aroma of flowers in bloom as the landscape is full of life, arguably one of the most beautiful months of the year in Michigan. If you “plant”-isize about a beautiful garden June is your month. Don’t let your commitment swoon to the garden as we approach the days of summer. Remember a thin layer of an inch or so of mulch for your landscape plants helps cool the roots and retain moisture as well as minimize weeds. Also remember your fledgling annuals are growing in leaps and bounds and are hungry. So are your Roses. They are heavy feeders and June is an important month to provide both dry and water soluble feeding to maximize performance. The hanging baskets that have been up since Mother’s day also need a feeding and attention when it comes to water on warm windy days. It’s easy to tell when they need water by just pushing up on the base of the basket with your hand and feeling the weight of the basket. Because soil contracts from the sides of the basket when dry, make sure to water thoroughly until the water is running out of the base of the basket. Don’t forget to pinch your Mum in June! 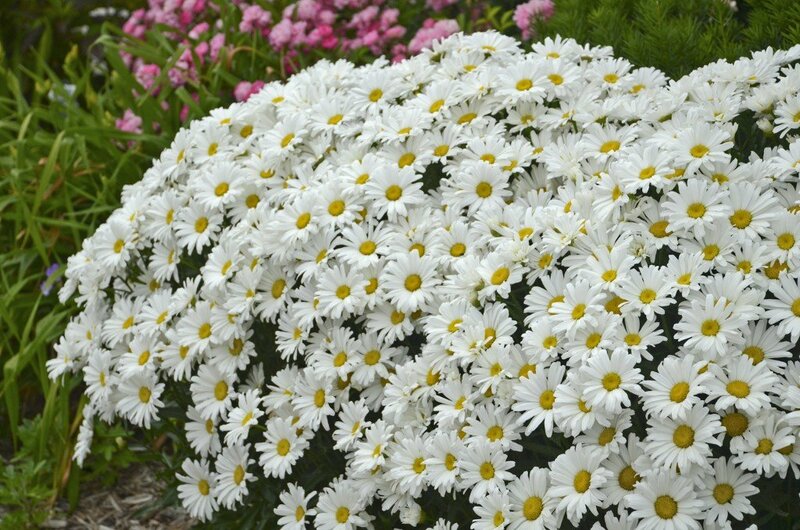 Pinch back mums to 6 to 10 inches above the ground until early July. This will provide nice sized blooming plants in fall that don’t become too tall and flop over in the landscape. June is a great month for planting herbs. Herbs love the longer days and the sunlight it provides. Enjoy the aroma of basil in the warm sun. I’m convinced basil planted in close proximity of tomatoes makes them taste better. No scientific evidence, just a thought to help you “plant” ahead. Use parsley as an ornamental plant border. Sage makes a great filler plant in mixed containers. Golden oregano is an outstanding and hardy perennial groundcover! Herbs grow best in a good humus soil with lots of sunlight. OK, I’m sending you to your “bloom”…..enjoy the romance of a June Swoon!